Located in the middle of Weimar, Haus am Horn has two major features: being the very first example of Bauhaus architecture and being the only classic example in Weimar. It was built in 1923 and listed as a UNESCO World Cultural Heritage site in 1996. 73 years after its establishment, and after all the tough times that the Bauhaus movement has gone through; it became a proved monument. This article will be focusing on its history, architecture, Bauhaus style, influences, and many more. 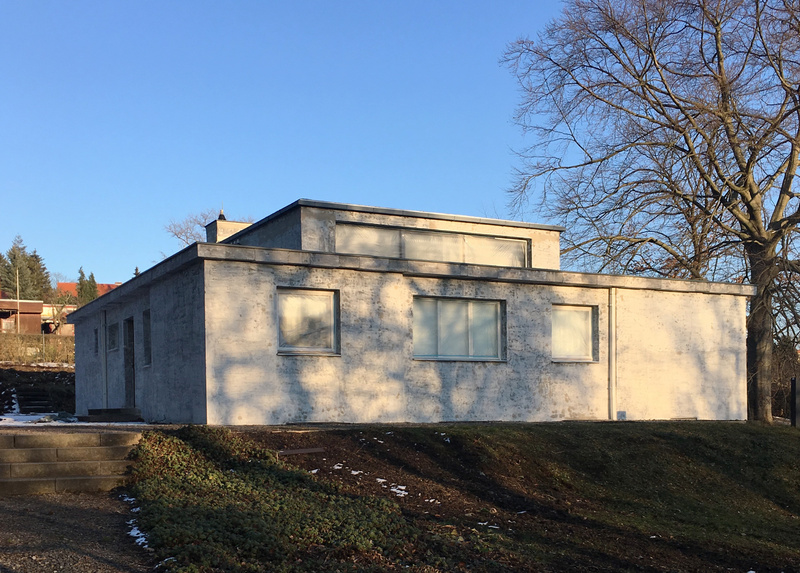 Haus am Horn was originally designed to provide a space for the Weimar Bauhaus exhibition in 1923 which would showcase a variety of student projects produced in the school. Contrary to popular opinion, it wasn’t designed by Walter Gropius. Even though he had planned to, painter Georg Muche’s plan was more appreciated by the students. Gropius agreed on the common decision, and his own architecture firm ran the process. Besides being the venue of the exhibition, it actually performs a much bigger duty which is being a prototype for the low-cost housing. Originally, Muche has already been working on an affordable house project that is easy to assemble and aesthetically beautiful for himself and his wife when the school announced the competition. By choosing the right materials and building techniques to lower the expenses, Muche didn’t only achieve his own goal but also followed the route of Bauhaus by focusing on functionalism. For the floor plan, he kept everything as simple as it needs to be; avoiding extremism while providing the requirements. Each room was designed for a certain purpose that would prevent them being used for any other function. He decided to set spare rooms for the members of the family, even for the parents; one for the man, one for the woman, one for the child/children, and one for the guests; plus a living room, a dining room connected to the kitchen, and an office space. The living room was considered as the heart of the plan. Occupying a full third of the overall footprint, it was located in the very center with its square shape. Since it was positioned away from the façade, the lack of daylight solved by placing clerestory windows lining the top of each wall which resulted as a higher rooftop rising from the middle that can be seen from the outside. The rooms in the layout were not randomly placed; the settlement followed a thoughtfully created order. It was to resolve any redundant areas and compose a route that would ease the life of the people living inside. For example, the side-by-side situation of the kitchen, the living room, and children’s room was conceived in order to make a practical connection, especially for the mother. Each room was facing the living room; a centralized spot to gather the family members. László Moholy-Nagy designed the lights, Marcel Breuer designed the furniture, Theodor Bogler designed the kitchen. The main idea behind Bogler’s kitchen was to set an order for the food preparation and remove all unnecessary steps along the way. By doing so, he could downsize the space and stay away from overspending. Credit: Freundeskreis der Bauhaus-Universität Weimar e. V.
The other issue in lowering the costs was dealing with the structural material and heating system. For the walls and ceiling, they came up with the idea of using torfoleum (a material comprising impregnated peat) sandwiched in-between cement-bonded slag concrete blocks which automatically helped reducing heating costs. In each process, there was a great contribution of the Bauhaus students. The wood-carving student Alma Buscher designed a series of colorful boxes for the children room. Produced in various sizes, they could be installed as seating, eating or playing areas depending on the user’s wish. The furniture used in the living room arose from the style of Gerrit Rietveld—one of the most important designers and architects of the 20th century. When we look at all these types of furniture, objects, and structural elements, even though there were many people commissioned for different actions, they all followed a common language: avoiding any ornamentation, extravagance, or over coloring; creating a simple balance between form and function. They have been aiming to implement what needs to be done: nothing more, nothing less. Haus am Horn is located a bit far from the city center and university, even though it was considered as an extension for the events and education. Well, it did host the Bauhaus exhibition as planned, but unfortunately, couldn’t become a campus due to the budget cuts and resettlements of Bauhaus. Until today, it has hosted various guests. Firstly, it became the residence of a lawyer, then a German military officer, finally a Bauhaus professor. After getting into the list of UNESCO, the renovation process started. Today, Haus am Horn still remains its valuable position in the history of the Bauhaus movement. The building is currently closed until a further notice due to the preparations for the Bauhaus anniversary in 2019. Guided tours for groups are possible according to state of the art care investigations and work on request.